Perfect Introduction to Physical Properties. 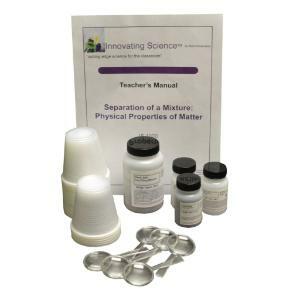 After a class discussion of matter and the fact that matter may differ from other matter in a variety of ways, students will examine three different solids individually and observe some differences in physical properties. Sand, iron filings and salt will be observed and tested using water and magnets. Based on what they find individually they will come up with a method (as a class or as groups) to separate a mixture of all three. Ordering information: Includes Sand, Salt, Iron Filings, 3 Part Mixture, Magnets, Plastic Cups, Magnifiers, and Teacher's Guide and Student Copymaster.